Facebook is a handy little tool (understatement? overstatement? ), especially for finding music. So it went this afternoon, as I was perusing the 'book and came across the loveliest of tunes with the loveliest of videos accompanying it, courtesy of my dear friend Amie (who just returned from the mountains to head to the sea...ah, the life). I listened to it and was totally hooked...if you like fiddles as much as I do, you'll definitely dig this (song after the jump). 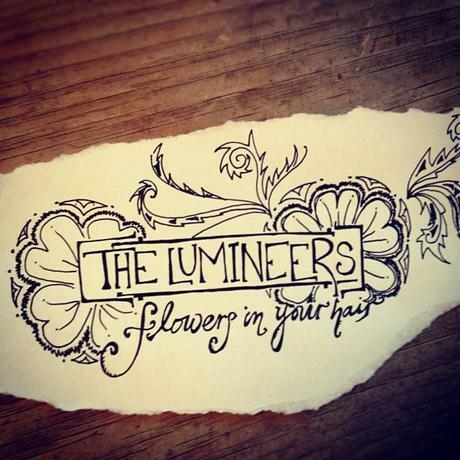 Wesley Schultz and Jeremiah Fraites founded The Lumineers in 2002 in NYC. Jeremiah's brother (who was also Wesley's best friend) had recently died of a drug overdose, and the two found comfort in playing music together. They soon decided a change of pace was in order and moved out to Denver, where they met Neyla Pekarek after placing an ad for a cellist on Craigslist. The three have been jamming together ever since, and I'm totally picking up what they're throwing down (is that saying cool? Questionable, Charlotte, questionable). So now, since this post is starting to sound like the landlord who rented me and my friend our apartment ("here's the lease, it's in a nutshell" and "I hope there are no skeletons on the closets"), I present to you The Lumineers, singing "Flowers In Your Hair." It's a really sweet video comprised of footage from their recent tour. I love their energy; it inspired some very flowy doodles in the photo above. Enjoy!